Alzheimer’s disease (AD) is a form of dementia characterised by the loss of long-term memories, possible emotional disturbances and behavioural abnormalities. It is strongly associated with advanced age, although cases of early-onset Alzheimer’s have also been observed. AD has a specific pathophysiology, or biological mechanism of progression. This condition is thought to be related to accumulations of beta-amyloid protein in various parts of the brain, particularly those associated with long-term memory storage and with their recollection. Beta-amyloid is present in the normal, healthy brain, but in the case of AD patients, the protein is not cleared away over time as it usually would be. As a result, it is allowed to build up within and around nervous-system cells, thus increasing their risks of toxicity and death over time. This build up is known as plaque formation, and is thought to be fatal to cells in the brain. This is why brain scans of AD patients show a reduction in the size of specific brain regions, which can become marked and significant over time. 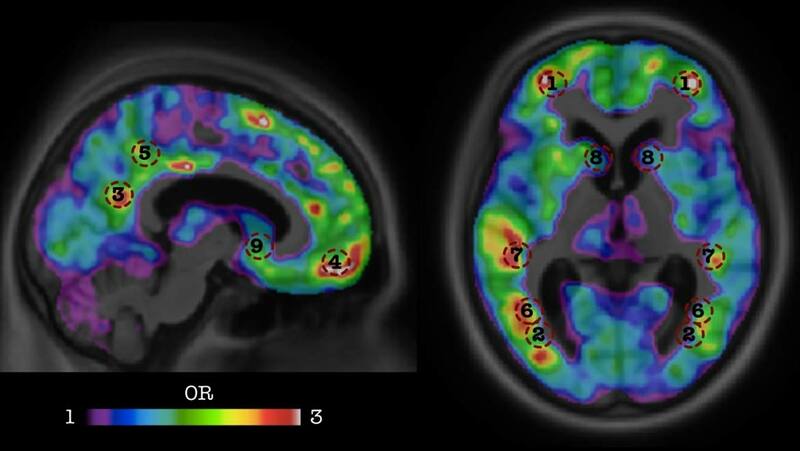 Beta-amyloid can be visualised using certain scan types, known as functional PET brain imaging. This is done by infusing the body with specially-designed markers that bind to and react with beta-amyloid. This produces a detectable fluorescence when the brain is scanned. PET scans set to display beta-amyloid have become a reliable and popular method to assess AD and its progress, due to its specificity, sensitivity and non-invasive nature. Despite the advancements in the study of AD, and the role of beta-amyloid in its pathology, measurements of beta-amyloid accretion (through PET imaging or otherwise) have not demonstrated the ability to become a significant indicator of AD risk (even though the brain-cell damage it may cause is). Now though, new research completed at McGill University in Canada may have resulted in algorithms that use PET-detected beta-amyloid in just one brain region as a new early-warning system that detects the probability of an individual developing AD. There are many forms of dementia, which may or may not have overlapping symptoms and pathologies. However, AD is the most common form of this condition, being responsible for up to 80% of dementia cases. AD involves the gradual, possibly irreparable loss of cells in specific regions until this deficiency manifests in cognitive, behavioural or emotional abnormalities. In the case of AD, this loss of tissue often affects the hippocampus more than any other part of the brain. The hippocampus is responsible for the long-term processing and storage of memories; therefore, patients with AD may appear to forget significant events, things and even people in their lives. This loss of brain tissue may require decades of progression before these symptoms are noticeable and quantifiable by neurologists and doctors. Many dementia subtypes, including AD may display mild cognitive impairments (or MCI, the first and most mild symptoms of this brain cell death, also known as neurodegeneration) prior to what can be considered ‘full-blown’ neurological illness. On the other hand, MCI is often difficult to diagnose, and may also be part of normal, non-disease-related aging; therefore, it’s not completely satisfactory as a red flag for AD. What this all means is that researchers and medical professionals have turned to the biological factors of pathophysiology to detect early AD. These ‘biomarkers’ include beta-amyloid, as outlined above, as well as other potentially pathological proteins such as the nervous-system product known as tau.. However, appreciable beta-amyloid levels are only present in the brain, whereas pathological tau can be found in the cerebrospinal fluid (CSF) that surrounds the brain and spine as a protective ‘buffer’ for the central nervous system. Samples of CSF can be taken out of the spine and used in the course of diagnostic analyses. Brain imaging, with or without PET, can also visualise neurodegeneration directly, but may detect more widespread tissue loss, and is thus less of a help for doctors with patients whose AD may be in its earlier stages. Beta-amyloid levels, on the other hand, would involve much more difficult, invasive and potentially dangerous procedures, was it not for the development of positronic emission topography (PET) based imaging that could detect amyloid in the brain through relatively harmless scanning. However, the progress in amplifying beta-amyloid ‘signal’ levels in PET images, especially at the early or preliminary stages of AD, has been sluggish up till now. Therefore, clinicians working on the brains of MCI patients would benefit from improved detection methods, including image-based algorithms, in the analysis stage of PET-enhanced AD diagnosis and risk assessment. These advancements would make early amyloid plaque formations a more concrete, robust marker of AD in people with MCI. It would also help doctors distinguish between individuals who are going to display incremental, ‘normal’ levels of MCI as they age from those who will succumb to full AD in the next few decades, or even years. Dr. Pedro Rosa-Neto and his team at the department of Neurology, Neurosurgery & Psychiatry at McGill set out to improve on the PET-linked algorithms that are already used to assess the risk of AD in MCI patients. 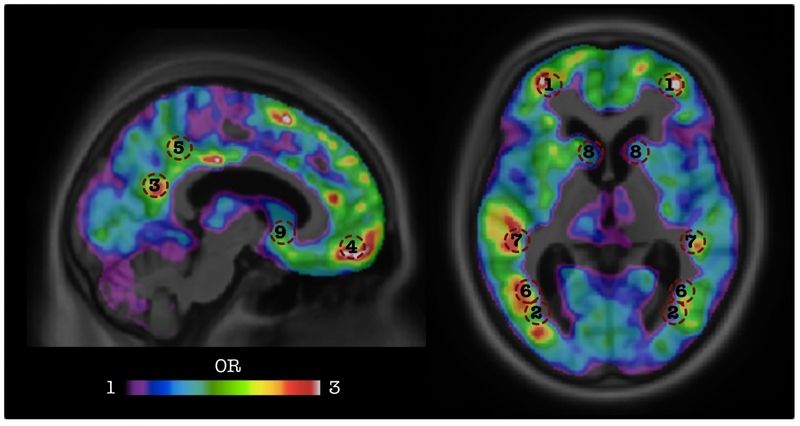 The team worked on optimising the focus on relevant features captured in amyloid-PET scans, and combined this with novel solutions for common PET imaging problems developed using machine learning. The resulting algorithm, known as RUSRF, reached an accuracy of 84 percent in predicting the progression from MCI to AD in 24 months, an improvement on existing algorithms used in the analysis of amyloid-PET scans. The new RUSRF algorithm may drive the optimisation of AD detection in at-risk individuals, reducing the costs and resources used in the diagnosis of this condition. The new detection method may also benefit patients through the earlier initiation of their treatment, and also identify suitable clinical-trial participants. Therefore, this revolution in PET use may benefit those affected by Alzheimer’s disease, as well as the work of those studying this condition and ways to improve its management. It is to be hoped that RUSRF can also be applied to other people with different risk factors, such as genetics, for this form of dementia. Mathotaarachchi S, Pascoal TA, Shin M, Benedet AL, Kang MS, Beaudry T, et al. Identifying incipient dementia individuals using machine learning and amyloid imaging. Neurobiology of Aging.